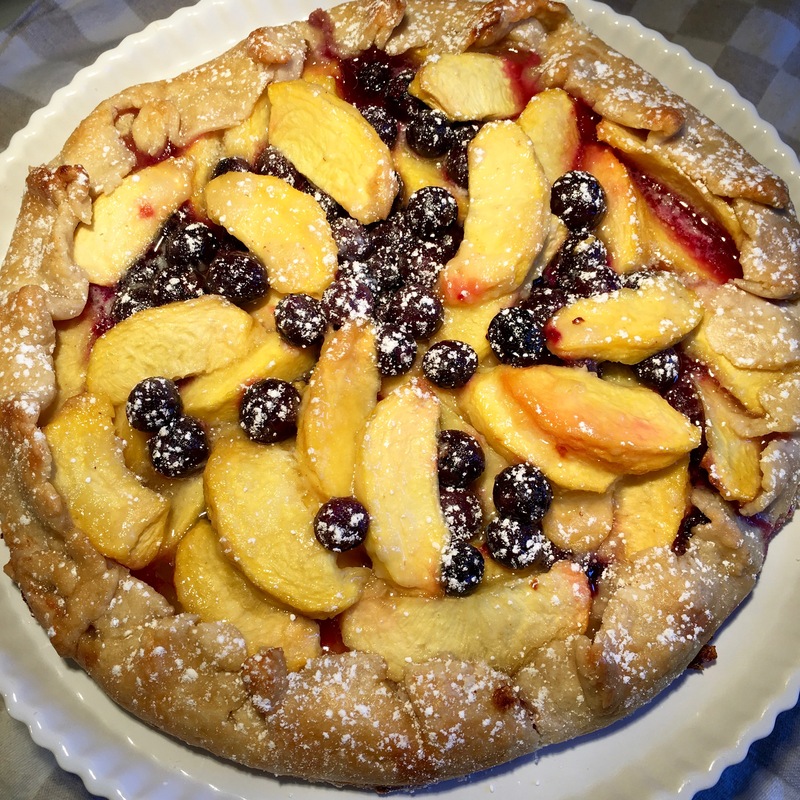 What is summer without peach blueberry pie? This is my favorite dessert served with vanilla ice cream. Every year I look forward to cooking with peaches and berries. Now that peach season has just began, I feel the need to bake this simple and easy pie. What I love about this pie is it’s rustic, no need to worry about it looking perfect. For the ingredients, you will need firm-ripe peaches. Stay away from the soft ones because the excess moisture in them makes the pie wet and soggy. You will also need fresh blueberries. Pick through the blueberries and discard the mushy ones. Wash and dry them with paper towels. 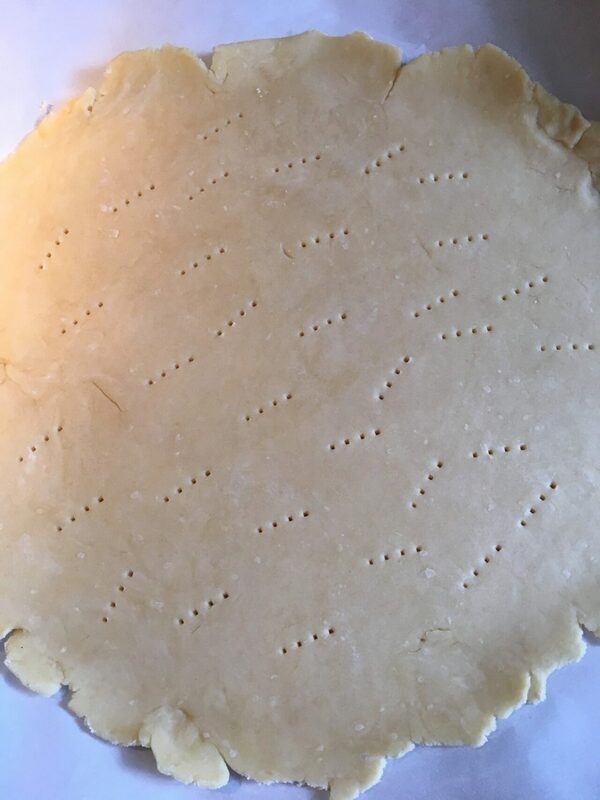 You can make the pie crust as shown below or use a store-bought one to save prep time. A little nutmeg, sugar, salt, butter, and honey adds flavor to the filling. To make the pie crust, first mix the 1 1/2 cups of flour and 1/2 tsp salt in a bowl. Next, cut in 1/4 cup each of cold butter and shortening with a pastry blender. (You can also use a food processor to mix this). Process the flour until it forms coarse crumbs. Then add 3 tablespoons of cold water and process again until dough comes together. (If not, add 1 more tablespoon of cold water and process again). With floured hands, shape the dough into a patty. Lay parchment paper on the counter and sprinkle it lightly with flour. Roll the dough until it is about 10 inches in circumference. Transfer the crust into a pie baking dish. Lightly press the bottom to fit the dish. You can also use a flat baking sheet if you like. It’s just as easy to lift the parchment paper with the pie crust and transfer it to the baking sheet. Before adding the filling into the crust, prick the bottom of the crust with a fork. For the filling, first mix the sugar, 1/4 tsp salt, 3 Tbsp flour and nutmeg. 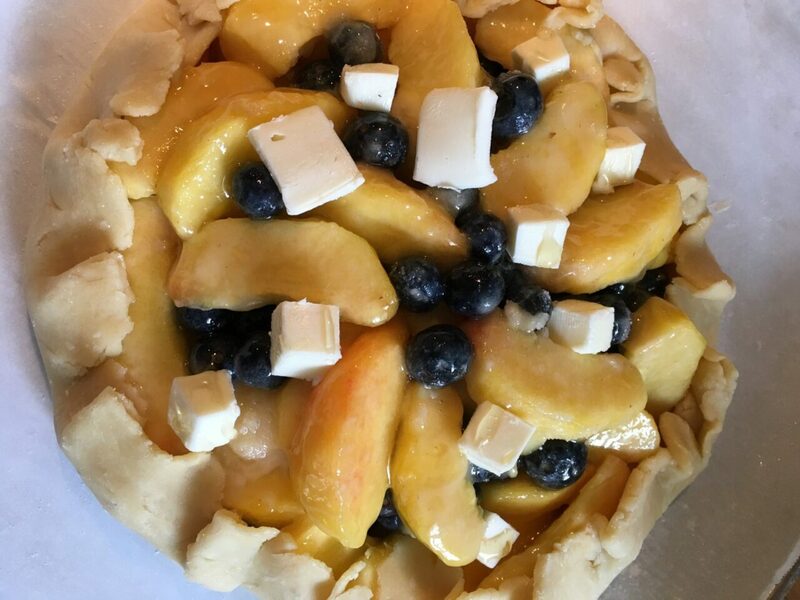 This flour mixture is then combined with the peaches and blueberries. Use a silicone spatula to mix so the blueberries don’t get crushed. Transfer the filling into the prepared crust. Dot the top with butter and drizzle it with honey. Fold the edges as shown on the picture here. Brushing the edges of the crust with egg wash makes it shiny. The pie is baked at 350 degrees for about 50 minutes to 1 hour until its bubbly and the crust is golden brown. Every oven is different so start checking on the pie after 50 minutes for doneness. Mine cooked the pie in 1 hour. So you see, that was not so hard to do. If you try baking this delicious pie, it will be a hit. Serve it warm with a scoop of vanilla ice cream. Peach season is here! What better time to bake this rustic peach blueberry pie. So good with vanilla ice cream. Lay parchment paper on the counter. Sprinkle it lightly with a bit of flour. Rub some flour in your hands and form the dough into a patty. Rub some flour on a rolling pin and roll out the dough on the floured parchment paper to about 10 inches in diameter. Preheat the oven to 350 degrees. Transfer the crust into a 9-inch pie baking dish or a flat baking sheet. Press the bottom lightly to fit the dish. (If using a flat baking sheet and you made the pie crust, transfer the parchment paper with the crust into the baking sheet.) Use a fork to prick holes in the bottom of the crust. Refrigerate prepared crust while you work on the filling. For the filling: In a small bowl mix together the sugar, 3 Tbsp flour, 1/4 tsp. salt, and nutmeg. 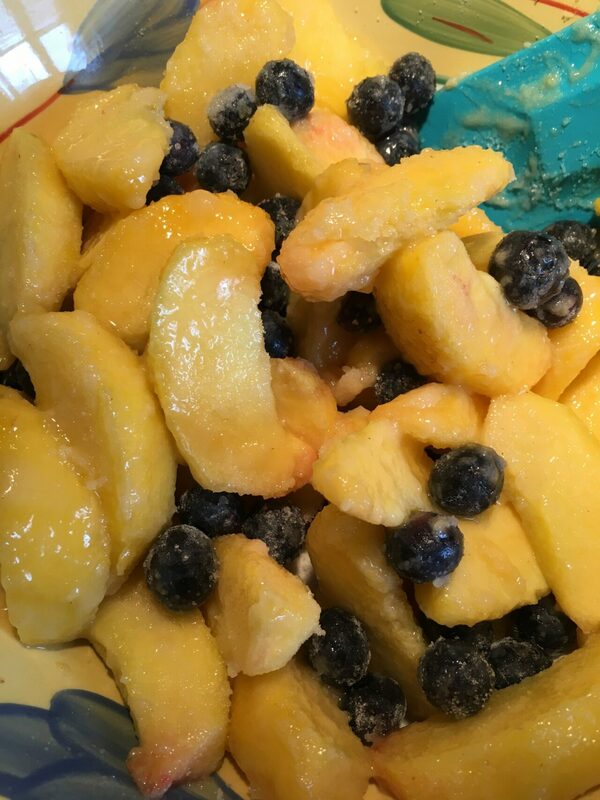 In a large bowl, combine the peaches, blueberries and the flour mixture. Use a silicone spatula to mix so the blueberries don't get crushed. Transfer the filling into the prepared pie crust. Dot the top with 2 Tbsp cubed butter and drizzle it with honey. Fold the edges of the pie as shown on picture here. Beat together 1 egg and 1/2 tsp water. Brush the edges of the pie with the egg wash. If using a pie dish, place the pie dish on a baking sheet. Bake the pie in the oven at 350 degrees for 50 minutes to 1 hour until it is bubbly and the crust is golden brown. Start checking the pie after 50 minutes for doneness. After it cooks, transfer the pie on a rack to rest. Serve it warm with a scoop of vanilla ice cream.